Jess Uy | Personal Finance & Global Investing: Term Insurance – Is it for Everyone? Term Insurance – Is it for Everyone? Term insurance may seem like the underdog when it comes to insurance policies because it lacks cash value. It may not be for everyone, but one should seriously think about getting a term policy over a whole life if their budget is rather limited. Affordability is a primary reason why people buy term. It is highly attractive to people on a budget who need high coverage but have limited resources. Plus the earlier you get the policy, the more you save. In fact, savings become exponential the younger you are. Young families or those with dependents will particularly benefit from this option. This group may find the option very attractive especially since they usually work with limited funds – balancing their financial resources for children’s education needs and retirement savings among other financial commitments. Let’s backtrack a little and define term insurance. This is a type of insurance policy that has a set duration limit for the coverage. Once it expires, the policy owner can decide to renew it or let the coverage end. It is the simplest and cheapest type of insurance policy. In three words – No cash value. Although term insurance does not have any cash value and can be considered as pure protection, there are ways to work around this limitation. One of the usual arguments against a term policy is that you do not get your money back, however, if you modify your term policy to lock in your prices until age 99, the chances of you getting money back is extremely high. Why? Think about it – How many people you know, have lived past 99 years old? Probably none (or maybe just a handful). Because most people don’t live to reach age 99, the insurance payout is almost 100% certain. The average life expectancy of males and females born in 2012 is 65 and 72 years old respectively (World Health Organization Philippine data - http://www.who.int/countries/phl/en/). 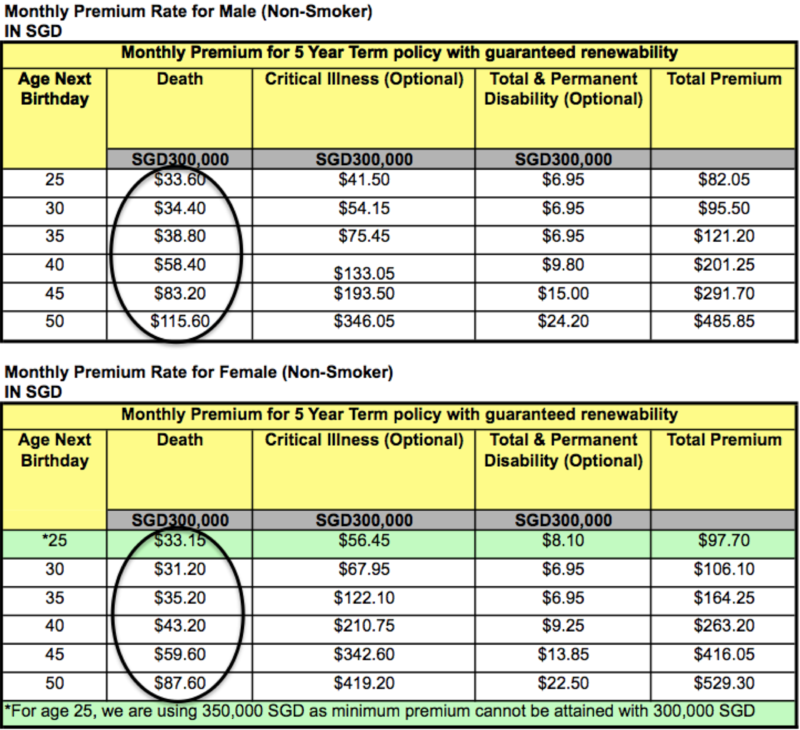 By simply extending the coverage of your term policy based on the average life expectancy age by another 20-30 years, the probability of an individual claiming back the premiums paid (and more) are very high. To recap, if you get a term insurance for the specific purpose of covering your family from risks in case of untimely death, there is almost 100% chance that you can claim (assuming the policy extends until age 99). Why? It is because no mortal being lives forever. As they say, “Nothing is certain in our worldly life except for death and taxes”. And you’d be surprised by the fact that in many cases, you could probably double or triple the money (premiums) you have paid in the worst case scenario especially if you are in your 20s and 30s. By getting adequate protection early (using a level term insurance), you lock in the price until the end of your coverage period chosen. Note that this is different from a yearly renewable term policy where the price changes every year. So the next question is, how do we know how much we actually need to cover for uncertain events in life? As for the coverage size, most Filipino’s insurance needs are usually higher than what they anticipate. A proper financial needs analysis is highly recommended to understand how much an individual actually needs. Generally speaking, the ideal life insurance sum assured for a breadwinner will typically be somewhere between 10M-20M PHP (300K-600K SGD / 250K-500K USD). This is calculated with inflation, education costs for children, living expenses, medical expenses, legacy, debt cancellation, estate taxes and other key factors in mind. Another way to calculate death coverage is to multiply your annual income by ten (10). These are just guidelines, estimates and references which may or may not be applicable to you so I highly recommend that a proper financial needs analysis be done to determine your real need based on your personal circumstances. On the other hand, if you want to get additional cover for Critical Illness (CI), the rough guideline to determine the sum assured is to set aside the ideal contingency fund required factoring in medical needs plus 3-5 years of income replacement. In the Singapore context, this is usually 100K to 150K SGD plus 3 to 5 years of annual income. Of course, you may modify this to suit your situation. There are also some insurance companies that do not require medical checkups for applicants who are fully healthy without any illnesses and the sum assured is equivalent to 1,500,000 SGD (~50M PHP or ~1M USD) and below. Age eligibility for this exception are for those who are 50 years old and below on their next birthday. To put these things in perspective, here are some figures calculated as an illustration for Filipinos who may want to avail of policies in Singapore (even if they are based elsewhere like Philippines, Middle East and other countries). Coverage is global with a few exceptions. There are now a lot of enhancements for insurance policies such as guaranteed renewability and convertibility options. For choosing coverage length, in case budget is an issue, I would recommend the guaranteed renewable term policies (renewable regardless of health condition), which is generally the lowest in cost. However, if you can afford the other durations and/or have specific temporary needs to address (Eg. education funding, debt repayment, retirement fund accumulation etc. ), go for the longer coverage (Eg. 15 years, 30 years, until 99 years, etc) to lock-in the rates as the guaranteed renewable policies increase rates every time the policy is set for renewal due to policyholder's age. Before you buy any policy, speak to a trusted, reputable and knowledgeable adviser to assess your needs. It is important to buy something that are based on your needs and preferences in accordance with your financial situation instead of just blindly following information shared for the general public. Just remember – protecting yourself or your family from catastrophic events is just as crucial if not even more so, than accumulating wealth! To learn more about Wealth Protection, join Jess at his upcoming seminars in Singapore and the Philippines. It's remarkable to the point that I can't bear to not experience this profitable data at whatever point I surf the web! The state of vacarinsurance just like any other state has its own regulations and mandated coverage for people that want to drive.